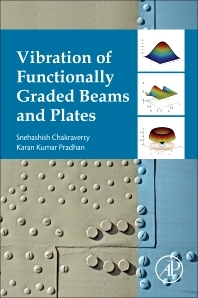 Vibration of Functionally Graded Beams and Plates uses numerically efficient computational techniques to analyze vibration problems associated with FG beams and plates. Introductory material on FG materials and structural members, as well as a range of vibration and shear deformation theories are discussed, providing a valuable summary of these broader themes. The latest research and analysis of vibration in FG materials is presented in an application-oriented manner, linking the research to its importance in fields such as aerospace, nuclear power, and automotive engineering. The book also features research on the complicating effects of thermal environments, piezoelectricity, and elastic foundations. The innovative computational procedures and simulation results are shown in full throughout, providing a uniquely valuable resource for users of numerical modeling software. This book is essential reading for any researcher or practitioner interested in FG materials, or the design of technology for the nuclear power, aerospace, and automotive industries. Snehashish Chakraverty is a recipient of various awards viz. the Indian Science Congress Association’s Platinum Jubilee Lecture Award, CSIR Young Scientist, BOYSCAST, INSA International Bilateral Exchange awards etc. and the Editor-in-Chief of the International Journal of Fuzzy Computation and Modelling. His research focuses on the application of numerical modelling to a broad range of problems, and he has been widely published in both books and peer-reviewed journals. Karan Kumar Pradhan is the Assistant Professor (NPIU, TEQIP-III) in Department of Basic Science, Parala Maharaja Engineering College, Berhampur (Odisha). Formerly, he was the Senior Research Fellow, Department of Mathematics, National Institute of Technology, Rourkela, India and also the recipient of SERB National Post-Doctoral Fellowship. KK Pradhan’s research interests are numerical modeling, vibration problems, and structural members.